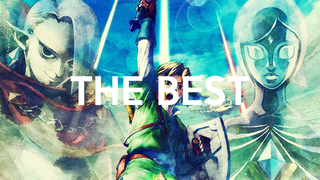 When you talk about the best Zelda game, you're bound to get plenty of people talking about Ocarina of Time, the Zelda title most often referred to as not only the best in the series, but the best game of all time. But the truth is Ocarina hasn't got anything on Skyward Sword. In just about every way, to boot. My history with Zelda runs deep. It was the first series I really grew to love as a kid, I still remember my grandma producing my brother's first gold NES cart from her purse for him on his birthday. It was The Adventure of Link, and I spent every waking moment trying to convince my brother to let me play it. Since then, I've been hooked, picking up every game since, and the single title I missed out on when it originally released. It's a bold statement to put the 25th anniversary in this game. It says that this is the game you've been waiting 25 years for, and it is. Skyward Sword took the formula Zelda is known for and improved on it in every way. From a gameplay standpoint, there's no comparison. Skyward Sword not only improves upon the best things from Zeldas past, but also adds a few new tricks along the way. Ocarina's then-revolutionary Z-targeting is present in Skyward Sword, but more refined, it's an improvement of Twilight Princess', which was an improvement of Wind Waker's. Wii MotionPlus allowed for an added layer of strategy when fighting enemies, and it changed the way we'll play Zelda forever. Having to make careful, deliberate swings connected you to Link in ways previous titles just couldn't. And that's to say nothing of the added weapon upgrade system, which puts Zelda further into the realm of contemporary RPGs. Both Skyloft and Hyrule are fantastic worlds, easily on par with —if not better than— those seen in other Zelda games. Skyloft is bursting with colorful characters, and gives you plenty of things to do. There's a point to visiting every place Skyloft has to offer, and the area doesn't feel as sparse as some of Ocarina's tended to. Wind Waker may have trounced Skyward Sword in this respect, but others hold it back. Above all else, Skyward Sword's narrative is far and away the best in the series. Zelda has never been a storytelling powerhouse, instead using OK storytelling to focus on absolutely stellar gameplay. In Skyward Sword we get the best of both worlds; for players that really care about Zelda lore, this is the definitive Zelda title. This is the story that started it all, that explains why Link, Zelda and Ganon are in every game. That explains the creation and the origin of the Master Sword, of Link's green outfit, of Ganon's signature look. The interplay between Link and other characters is more expressive and telling in Skyward Sword than in any other title. In the end, Skyward Sword proves that it is a Zelda worthy of the 25th anniversary title, it takes the things that made its predecessors great, improves them, and adds its own unique flourish. Excellent dungeon design (for being widely regarded as the best Zelda, Ocarina's Water Temple was one of the most frustrating I've ever seen), an improved combat system and the best story ever in a Zelda game come together to make Skyward Sword not just one of the best Zeldas, but one of the best games I've ever played.